Natural Health Practice - Healthy Woman Support is a special, complete multivitamin and mineral formulation created for every woman to help maintain a healthy, active lifestyle and optimum well-being. It must contain nutrients in their most bio-available form for maximum absorption so you get the most from the supplement. 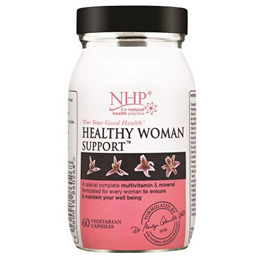 Healthy Woman Support is in easy to swallow vegetarian capsules and contains 33 nutrients including vitamins A, C, E, D, all the B vitamins, calcium, magnesium, selenium, zinc, iron, manganese, lutein, acetyl-L-carnitine, alpha lipoic acid, co-enzyme Q10, aloe vera, grape seed extract, green tea extract, bilberry, seaweed and cordyceps. Choline is included which contributes to the maintenance of normal liver function and also biotin which contributes to the normal release of energy for use in the body. Folic acid is also one of the nutrients in Healthy Woman Support which contributes to the normal function of the immune system and Iodine (from seaweed) contributes to the normal production of thyroid hormones and normal thyroid function. Free from gluten, yeast and dairy products, Healthy Woman Support is made without the use of artificial flavours, colours or preservatives, it is Kosher and approved by the Vegetarian Society. Vitamin C (As Magnesium Ascorbate), Vitamin E (As D-Alpha Tocopheryl Succinate), Green Tea Standardised Extract, Seaweed Extract (Seagreens), Acetyl L-Carnitine, Alpha Lipoic Acid, Choline Bitarate, Cordyceps Standardised Extract (Cordyceptic Acid), Aloe Vera Extract, Aloe Barbadensis Inner Leaf, Bilberry Extract 4:1 (Vaccinium Myrtillus Berry), Grape Seed Standardised Extract (Vitis Vinifera Seed), Niacin (As Nicotinamide, Vitamin B3), Pantothenic Acid (As Calcium Pantothenate, Vitamin B5), Riboflavin (Vitamin B2), Thiamin (As Hydrochloride, Vitamin B1), Vitamin B6 (As Pyridoxal-5-Phosphate), Calcium (As Citrate), Magnesium (As Citrate), Zinc (As Citrate), Inositol, Coenzyme Q10, Iron (As Gluconate), Manganese (As Citrate), Beta Carotene (Dunaliella Salina Algae), Vitamin A (As Retinyl Acetate), Folic Acid (Folacin), Biotin, Chromium (As Picolinate), Selenium (As Methionine), Vitamin B12 (Hydroxycobalamin), Lutein, Vitamin D3 (Cholecalciferol), Capsule Shell: Hydroxypropyl Methylcellulose. For best results take one capsule, twice daily. Below are reviews of Natural Health Practice Healthy Woman Support - 60 Capsules by bodykind customers. If you have tried this product we'd love to hear what you think so please leave a review.